The last decade of the 20th century witnessed a revolution in the development and application of mathematical techniques to origami, the centuries-old Japanese art of paper-folding. From its origins in early Japan, origami was, for years, a source of toys and simple, abstract shapes, but in the 20th century, a Japanese artist took the simple crafts to new heights, igniting a worldwide interest and, ultimately, an artistic explosion. And some of that artistic growth came from a most unlikely quarter: the world of science and mathematics. The introduction of mathematical ideas into origami revolutionized the art, and more. The techniques used in mathematical origami design range from the abstruse to the highly approachable. In this talk, Lang introduces the art and then describes how geometric concepts led to the solution of a broad class of origami folding problems – specifically, the problem of efficiently folding a shape with an arbitrary number and arrangement of flaps, and along the way, enabled origami designs of mind-blowing complexity and realism. But then, as often happens in mathematics, theory originally developed for its own sake led to some surprising practical applications. The concepts and theorems of origami design have shed light on long-standing mathematical questions and have solved practical engineering problems that include safer airbags, medical implants, self-folding polymers, Brobdingnagian space telescopes, and more. 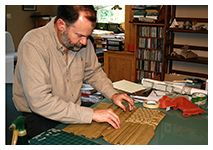 Robert J. Lang is recognized as one of the foremost origami artists in the world as well as a pioneer in computational origami and the development of formal design algorithms for folding. With a Ph.D. in Applied Physics from Caltech, he has, during the course of work at NASA/Jet Propulsion Laboratory, Spectra Diode Laboratories, and JDS Uniphase, authored or co-authored over 100 papers and 50 patents in lasers and optoelectronics as well as authoring, co-authoring, or editing 14 books and a CD-ROM on origami. 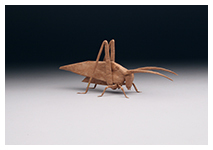 He is a full-time artist and consultant on origami and its applications to engineering problems and his work spans the worlds of mathematics, physics, lasers, sculpture, and fine art. His art has been exhibited at more than 50 exhibitions around the world, including the Museum of Modern Art in New York City and international exhibitions in Paris and Austria. He was Editor-in-Chief of the IEEE Journal of Quantum Electronics from 2007–2010. He received Caltech’s highest honor, the Distinguished Alumni Award, in 2009, was selected as an Honorary Member of the British Origami Society in 2011, and was elected a Fellow of the American Mathematical Society in 2013.